Every president since Lyndon Johnson has reiterated the U.S. commitment to maintain Israel's qualitative military edge (QME). The principle behind this commitment is simple: Israel is a bastion of liberal, representative government in the Middle East and, as such, its survival is a vital U.S. national interest. To ensure the continued existence of this longtime U.S. ally in a sea of countries that reflexively call for its destruction, Israel must be able to defend itself militarily and deter aggression. While a coalition of Arab states can always outnumber Israeli forces in terms of troops, artillery, tanks, and combat aircraft, the United States can assure its survival if Israel is able to maintain qualitative military superiority, relying on more advanced weaponry, training, leadership, and tactics to deter or defeat its adversaries in the Middle East. But while maintenance of Israel's QME continues to be in the U.S. strategic interest, the shifting political and military dynamics in the Middle East demand a clearer definition of QME and mutual agreement between Washington and Jerusalem about how that QME can and should be maintained. As the conventional weaponry and training of the other regional states has caught up to that of Israel, the Israeli government has relied increasingly on its unacknowledged nuclear capability to deter its potential adversaries, reducing the effect that U.S. regional arms sales have on Israel's QME. For Washington, arms sales are powerful political and military signals of the U.S. intention to stand by its allies, both Israeli and Arab. At the same time, the potential adversaries against whom QME must be maintained are changing. States such as Egypt and Saudi Arabia now pose less threat and even find themselves strategically aligned with Israel in their desire to contain and deter Iran's regional aims and the development of the Islamic Republic's own nuclear capacity. Because the strategic bifurcation of the Middle East into Israel and a monolithic Arab bloc is no longer relevant, traditional assumptions regarding QME do not hold true anymore. For example, the sale of sophisticated conventional weaponry to Arab states no longer necessarily implies a corresponding reduction in Israel's QME. Instead, such a sale is a double-edged sword, reducing Israel's QME to the extent such Arab states continue to represent Israeli adversaries but increasing Israel's QME by increasing the military capability of states aligned with it in their desire to deter Iranian aggression. Any new concept of Israel's QME should consider this dynamic and both inoculate Israel against threats from its neighbors and also account for Israel's and the United States's mutual interest in ensuring that moderate Arab states retain sufficient capability to deter Iranian belligerence. U.S. interests are linked with those of Israel for historic, moral, and political reasons. Ever since President Harry Truman recognized the new Jewish state on May 14, 1948, Washington has supported or implicitly guaranteed its survival. During the Cold War, Israel was an essential partner in the struggle to limit Soviet influence in the region. David Ben-Gurion, the first prime minister of Israel, established its basic defense doctrine in 1953, determining that Israel had to maintain a qualitative edge since it could not overcome its quantitative inferiority. Only in 1968, though, when President Lyndon Johnson approved the sale of F-4 Phantom fighters to Israel in the wake of the French decision to embargo arms sales to Israel, did Washington begin to implement a commitment to augment Israel's qualitative edge over its neighbors. Israel's victories, first in the 1967 Six-Day war and then in the 1973 Yom Kippur war, led Egyptian president Anwar Sadat to conclude that Israel could not easily be defeated militarily. This realization set the stage for the future Egyptian-Israeli settlement and bolstered the argument within the Israeli government that QME served a political as well as military function. After the 1973 war, the United States quadrupled its foreign aid to Israel, replacing France as Israel's largest arms supplier. The U.S. government, however, also continued to supply weaponry to Israel's neighbors, Lebanon and Saudi Arabia, to counter Soviet arms sales in the region. Today, Israel remains the largest recipient of U.S. foreign military financing, recently signing a $30 billion military aid agreement, equivalent to a 25 percent increase in military assistance over the next decade. Ronald Reagan made the commitment to Israel's qualitative edge explicit, an assurance every subsequent U.S. administration has reiterated. Nonetheless, during the Reagan years, the qualitative gap between Jerusalem and Riyadh shrank dramatically. With the 1981 sale of AWACS airborne radar systems to Saudi Arabia, the United States eroded the Israeli air force's edge over any hostile Arab coalition. As Israel's technological advantage in weapon systems diminished throughout the 1980s and 1990s, U.S. officials argued both that the Israeli military still maintained the QME at the subsystem level, with improved software and more lethal targeting systems, and also that superior Israeli tactics, training, logistics, and morale compensated for Arab high-tech arms purchases. Israeli officials disagree. Since the mid-1980s, many of Israel's traditional adversaries including Egypt and Jordan have taught their troops U.S.-style combat tactics, sent their officers and senior enlisted troops to U.S. and European military courses, and participated in joint exercises with U.S. and other Western forces. The degree to which Israeli combat tactics remain superior to those of its Arab foes has decreased but to what extent is uncertain. U.S. officials have fulfilled QME commitments to Israel either by downgrading the capability of weapon systems that it sold to Arab states or by upgrading versions sold to Israel. On several occasions, the United States sold "balancing" weapons packages to the Israelis whenever a major deal was concluded with Saudi Arabia or other Middle Eastern states. While increased U.S. arms sales and involvement in the Middle East since the 1980s may have degraded the capability gap between Israel and its Arab neighbors, Israel's not-so-secret nuclear arsenal is the ultimate expression of its QME. According to unclassified U.S. intelligence estimates, Israel possesses between 75 and 130 nuclear weapons. Israel will not confirm that it has nuclear weapons, choosing instead to maintain a policy of "nuclear ambiguity" in which it says it will not be the first country to introduce nuclear weapons into the Middle East. No adversary can initiate hostile action against Israel without considering potential nuclear retaliation. That the White House never openly questions Israel's need for this arsenal or criticizes its expansion demonstrates U.S. commitment to QME, particularly because this silence is at odds with articulated U.S. positions on nuclear nonproliferation. The Department of State' Office of Political Military Affairs is responsible for weapons sales and exports and, therefore, has the interagency lead for QME. However, the interagency community routinely considers release of sensitive weapons systems through the National Disclosure Policy Committee. The general committee members are the secretary of state, the secretary of defense, the secretaries of the army, navy, and air force, and the chairman of the Joint Chiefs of Staff. In practice, the Department of State also relies on inputs from the intelligence community to make QME determinations. A sensitive weapons system can only be released if there is consensus support for release of that system. Israeli military officials also have some input. At the annual Defense Department Joint Political Military Group meeting, Israeli officials list systems whose possession by their adversaries they deem threatening to their QME. Israeli policymakers define their QME as "the ability to sustain credible military advantage that provides deterrence and, if need be, the ability to rapidly achieve superiority on the battlefield against any foreseeable combination of forces with minimal damage and casualties." In assessing QME, Israel focuses on the threats from advanced weapon systems rather than on platforms with the exception of submarines and unarmed aerial vehicles. Other Israeli considerations include geographic proximity, transferability, precedents, and synergy between different systems. While there is no congressionally-mandated requirement to submit a report on Israel's QME from a qualitative or quantitative basis, Section 404(c) of the Foreign Relations Authorization Act, Fiscal Years 1992 and 1993 (P.L. 102-138) requires the president to submit to Congress annually the Middle East Arms Transfer Report, which documents all transfers of conventional and unconventional arms by any nation to the Middle East and Persian Gulf region and analyzes their effect on the regional military balance. Additionally, when the Defense Security Cooperation Agency notifies Congress of proposed arms sales to the Middle East, it includes a statement about the expected impact on Israel's QME. Still, no U.S. intelligence agency conducts an annual review of Israel's QME or the impact of U.S. arms sales in the region, and Congress can and has objected to the executive branch's determinations of weapons release. In 1998, for example, congressmen raised concerns that "sales of sophisticated equipment could erode Israel's qualitative edge over its Arab neighbors, if the Gulf states were to join a joint Arab military action against Israel." Building the confidence necessary for Israel to take calculated risks for peace, as evidenced by Israel's disengagement from Gaza and parts of the northern West Bank in 2005. Israel's QME cannot be the only consideration in U.S. decision-making. The U.S. government must, first and foremost, defend the vital interests of the United States and its citizens. Any U.S. decision on weapons sales to the region must look at the broader military balance, Arab capabilities, the current political-military environment, and U.S. foreign policy interests. Such issues highlight the lack of analytical framework or methodology to assess QME. According to the Israeli definition, QME can equate to Israel versus most of the Arab Middle East and Iran, but if U.S. policymakers took the traditional Israeli definition at face value, Washington could not arm Persian Gulf allies that support U.S. policy vis-à-vis Iran. This is significant given the fact that both the Persian Gulf states and Israel rightly view the Iranian regime as their greatest military concern. The Iranian challenge to U.S. interests is acute. It remains the leading state sponsor of terrorism. The Islamic Revolutionary Guards Corps exploited the July 2006 Hezbollah war with Israel to advance its regional policy goals in the Levant. Iranian officials have provided training, funds, and weapons to a variety of Shi‘i militias in Iraq that used improvised explosive devices to maim and kill U.S. and coalition troops. The regime has utilized instability in Iraq and Afghanistan to reassert an Iranian claim to regional power status. Iran's weapons of mass destruction capability and ballistic missile arsenal are significant. U.S. intelligence agencies have determined Iran is likely pursuing chemical and biological weapons. While such weapons would be of limited military value, they could nevertheless change the nature of a conflict as they would have psychological and possibly political effects far greater than their actual military impact. Iran's ballistic missile inventory is among the largest in the Middle East. One of the most disturbing aspects of the Iranian WMD program is its determined effort to construct ballistic missiles that will enable Tehran to deliver conventional or, potentially, chemical, biological, or nuclear warheads against its neighbors in the region and beyond. Iran claimed last fall that its Shahab-3 missile can strike targets at distances up to 1,200 miles, including Israel, Egypt, Turkey, Saudi Arabia, Afghanistan, India, Pakistan, and southeastern Europe. Iran's Shahab-4 will have twice that range at 2,400 miles, allowing Iran to strike Germany, Italy, and Moscow. The Iranian government has developed an extensive infrastructure, from laboratories to industrial facilities, to support its research for nuclear weapons. It has continued its efforts since December 2005 to resume enrichment of uranium in defiance of the international community. Short of military intervention and subsequent regime change, the Islamic Republic could have a nuclear weapon sometime in the beginning to the middle of the next decade. A nuclear-armed Iran would pose a serious strategic threat to the United States and its allies because the leadership in Tehran would be emboldened to advance its ambitions in and outside of the region, both directly and through terrorist proxies. Nuclear weapons could thus lower the threshold for Iran's use of conventional force. Iranian decision-makers might believe that their nuclear arsenal would protect the country from retaliation and so might act more readily against U.S. forces and allies both in the region and elsewhere. As RAND Corporation's David Ochmanek argues, a "nuclear-armed Iran is likely to demonstrate more risky and assertive behavior—particularly in areas like terrorism—and significantly increase the risks for escalation, even if unintended." A nuclear Iran would also exacerbate regional tensions, especially given the possibility that Israeli officials would seek to preempt Iranian capability. The specter of a nuclear-armed Iranian regime, committed according to its own statements to the destruction of Israel and the initiation of a renewed Holocaust, does not require extensive explanation. Many experts agree that maintaining a stable deterrence relationship with Iran would prove far more difficult than the U.S.-Soviet experience in the Cold War. An ideologically expansionist, nuclear weapons-emboldened Iran also represents a threat to the energy-rich, Sunni-ruled Persian Gulf states. Iran is already expanding its claims to oil and natural gas fields in the Persian Gulf and the Caspian Sea, and a more assertive foreign policy will almost certainly follow Iran's mastery of the nuclear fuel cycle. This has led to what Secretary of State Condoleezza Rice describes as "a new strategic alignment" in the Middle East that pits Washington and those governments with a desire to strengthen peace and stability against those who support the violent extremism of states such as Syria and Iran. In this alignment, U.S. policymakers count as their allies Turkey, Israel, Egypt, Jordan, Bahrain, Kuwait, Oman, Qatar, Saudi Arabia, and the United Arab Emirates, along with the leaders of Lebanon, the Palestinian Authority, and Iraq. For the first time, Israel and most Arab countries in the Middle East find themselves partners because of their mutual shared distrust of Iran. Their strategic alliance—which exists even if it remains unacknowledged—could represent the first line of defense and deterrence for the United States against Iran. To help strengthen this tenuous coalition designed to contain Iranian influence and bolster regional defenses and deterrent capabilities, the U.S. government initiated the Gulf Security Dialogue, a diplomatic effort focused on arms sales and assistance such as port security and energy infrastructure protection for Saudi Arabia, Qatar, Kuwait, the United Arab Emirates, Bahrain, and Oman. A failure of this strategic partnership to mature would further embolden Iran as a destabilizing force in the Middle East and enable it to undermine U.S. interests in a variety of spheres. In such a situation, reassessing the manner in which the U.S. government considers the QME is necessary. At present, no Arab state appears eager to launch a war with Israel. Iraq is no longer a threat. Syria suffers from aging equipment and a limited air force capability, and the Middle East peace process has, for all practical purposes, eliminated Jordan as a danger to Israel and muted any Egyptian threat, at least in the near term. While Hezbollah's perceived victory in the summer of 2006 could encourage potential Arab adversaries such as Syria to accelerate development of asymmetric warfare capabilities, conventional war is extremely unlikely in the near to mid term. Israel does face a growing asymmetric threat from organized terrorist units, long-range surface-to-surface missiles, and weapons of mass destruction, but Jerusalem retains its advantage in space reconnaissance, long-range missiles, nuclear weapons, and anti-tactical ballistic missiles, all of which are part of Israel's deterrence strategy. Asymmetrical threats and terrorist attacks will still likely remain Israel's most pressing day-to-day concern, one that Israel's QME will be incapable of neutralizing, but any existential threat will likely be external. Israeli strategists also worry about long-term regime stability in Egypt, Jordan, and Saudi Arabia, but such future concerns cannot drive U.S. policy away from addressing immediate, high-priority threats to itself and its allies, which in this case center upon the common Iranian threat. This will require U.S. clarification with Israel over the QME. Israeli officials still consider sale of advanced weapons to regional Arab states to represent erosion of their qualitative edge. By the Israeli definition of QME, they are correct: Any weapons release to an Arab country adversely affects Israel's QME. But there are signs that the Israeli government is beginning to take a more pragmatic stance with regard to U.S. arms sales to Washington's Arab allies. The U.S. government—both the Bush administration and various congressional committees—have, since early 2007, been considering a $20 billion weapons package to Saudi Arabia and several other Persian Gulf states. Notably, Israeli prime minister Ehud Olmert has not publicly objected to these sales and has acknowledged the need for Washington to support Arab states opposed to Iran. But pro-Israel lobbyists still use their influence in Congress to suggest limits to the package, such as restricting deployment of certain systems to the immediate Persian Gulf region and eliminating specific precision systems from the sale. What if Washington does not supply weapons to Middle Eastern states? What might occur if the U.S. policymakers accede to Israeli pressure not to counterbalance Iranian aggression with arms sales to Arab allies? Increased instability is the likely result with more sectarian strife in Iraq and uncertainty in Lebanon. With an emboldened Iran fueling instability, many Middle Eastern countries will spend more on high-tech arms from external suppliers while accelerating their indigenous capabilities to develop and produce rockets, missiles, and other weaponry. Should the U.S. government decline to provide weaponry, a number of countries, including Russia, China, France, Great Britain, and others, would fill the gap without regard to QME concerns. For example, in 2006, Saudi officials signed a memorandum of understanding with the British government to purchase 72 Typhoon multi-role jet fighters worth approximately US$21.2 billion, and Riyadh is currently negotiating with Russia to buy 150 T-90 tanks worth at least $1 billion. The United Arab Emirates' air force has solicited bids for an aerial electronic warfare and early warning platform, a deal worth about $1 billion. Should U.S. companies lose arms sales to the region, the U.S. government will also lose leverage and senior leader access, counter-proliferation influence, and procurement savings inherent to each sale, as well as interoperability, which is crucial should there ever be a crisis requiring U.S. deployment and coalition operations. The effect could be long-term. If, for example, U.S. officials do not sell the littoral combat ship to Saudi Arabia, it could take between twenty and thirty years until U.S. officials would have another opportunity to regain influence with the Royal Saudi Naval Forces. In the past, relationships forged through weapons sales and security cooperation have led to increased basing rights, pre-positioning of equipment, and access to port facilities. Past weapons sales proved crucial to Operations Desert Shield and Desert Storm, Operation Iraqi Freedom, and in the global war on terrorism. Fulfillment of arms sales packages does not equate to abandoned leverage. The Pentagon retains influence with provision of repair parts, technical assistance, and upgrades. U.S. authorities are more likely to limit weapons sales to less capable export variants or smaller quantities than other exporting nations. For example, the recently delivered advanced medium-range air-to-air missiles (AMRAAM) for the Saudi Arabian air force are less capable than the NATO-standard version provided to Israel. Precision targeting systems like the Harpoon II and Joint Direct Attack Munitions (JDAM) are dependent upon U.S. supplied software, which could be cut off if need be. 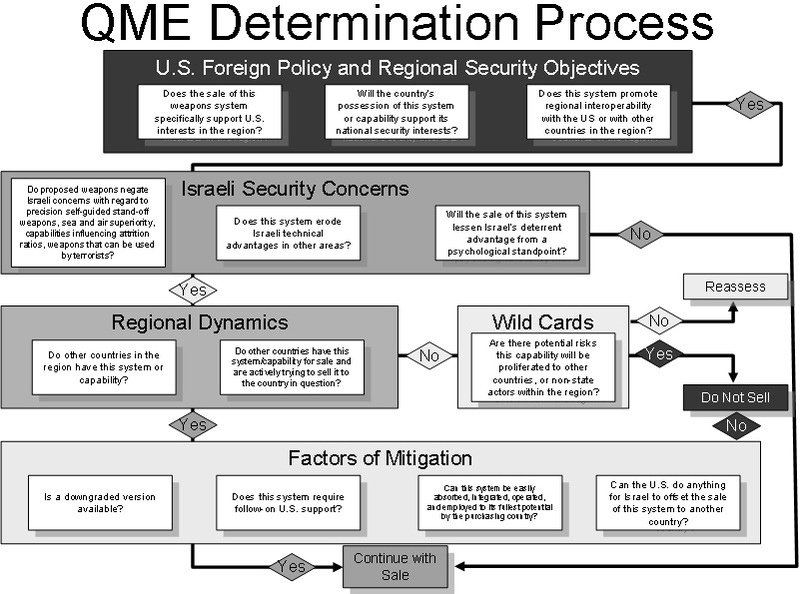 As the United States and Israel confront new challenges, revising the QME understanding and process is essential. Such revisions need not be controversial nor alter the fundamental relationship between Washington and Jerusalem. Both countries should agree to a joint definition of the QME and infuse such a definition with rigorous joint analysis. Both governments should conduct a joint strategic assessment of the current security environment in the Middle East and North Africa. Based on this assessment, Israeli strategists would acknowledge that the largely Sunni Persian Gulf emirates are unlikely to attack Israel or join in any coalition to wage conventional war against it. While Israeli concerns about future regime change in Saudi Arabia and Egypt are understandable, they pale against the real and present threat posed by Iran. In order to further allay Israeli concerns, the U.S. interagency process might assess on an annual basis what "likely" combination of regional conventional forces could threaten Israel in the next seven years. Israeli officials should also recognize that opposition to U.S. weapons sales to Washington's Persian Gulf allies is counterproductive. Both the United States and Israel require well-armed Arab allies to confront and contain the Iranian regime. One possible way to reassess Israeli QME with regard to future weapons sales to the region would be a regional, security-based approach. At present, no "decision tree" exists to aide analysts when considering weapons sales to Middle Eastern states. Table 1 suggests a possible approach. Under such a system, U.S. officials would have to determine that any potential weapons sale bolsters regional alliances and deters radical regimes such as those in Syria and Iran, that the country's strategic framework within the region justifies the sale, that the country's possession of this system or capability supports its own national security interests, and that the system promotes interoperability with the U.S. military. If the answers are negative, the request for the sale should be denied. However, if they are affirmative, the arms sale might then be addressed against Israeli concerns. Such analysis would consider whether the proposed system would erode Israeli technical advantages in other areas to include armor, self-propelled artillery, targeting and counter battery systems, air intercept and strike aircraft, attack helicopters, unmanned aerial vehicles, standoff precision guided air-to-ground munitions, surface-to-air missiles, anti-ship missiles, ballistic missiles, and theater ballistic missile defense. Finally, analysis should assess whether the sale of this system would lessen Israel's deterrent advantage from a psychological standpoint. If the answers are "no," the arms sale might be approved; however, if the answer to any questions were "yes," the request should then be further analyzed in context of regional dynamics. This would address whether other countries in the Middle East already possessed the system or capability, or if other countries such as France, Britain, China, or Russia also sought to sell the system to the country in question. If the answers are negative, analysts might consider wild card scenarios, such as the risks that the capability could proliferate to other countries or non-state actors within the region, and whether U.S. ability to influence the country through training and spare parts sales would outweigh those risks. If the answer to any of these questions is "yes," the request for the weapons sale would be analyzed against a number of mitigating factors. The U.S. government has often sold downgraded weapon systems to Arab states and upgraded versions to Israel or leveraged "balancing" weapons packages to the Israelis alongside sales to Saudi Arabia and other Arab states. Analysts might continue to determine if a downgraded version of the weapon is available and whether U.S. officials could mitigate technical capabilities through the withholding of maintenance, satellites, software upgrades, guidance data links, global positioning systems, or digital imagery enhancement techniques. The interagency could adopt other analytical tools as well, such as a capabilities-based approach using a doctrinal, organizational, training, materiel, leadership, personnel, and facilities methodology to analyze Israel and likely combinations of its regional adversaries. The U.S. government could sponsor war games using simulations to analyze the effects of arms sales on Israeli QME. Such simulations use investigative/causative or deterministic/process flow modeling to help correlate how minute changes in a system affect the behavior on the entire system. Examples include Science Applications International Corporation (SAIC)'s situation intuitive assessment model, a decision-making tool that breaks down complex issues so that important relationships can be recognized and evaluated, and the Institute of Electrical Engineers' STELLA model, a dynamic simulation model that allows qualitative analysis of a system and determination of the cause and effect relationships between activities. A paradigm shift in how U.S. and Israeli policymakers approach the QME will not only enable Washington to renew its public commitment to ensure Israel's survival, but, by creating a mechanism to help defend moderate Arab states from the Iranian threat, it will also begin to repair the image of the United States in at least part of the Arab world. It is not in the interest of either the United States or Israel to allow misapplication of QME to hamper combined response to the threat of Iranian aggression and terror. William Wunderle, a U.S. Army lieutenant colonel, and Andre Briere, a U.S. Air Force lieutenant colonel, are both Middle East political military planners in the Joint Strategic Plans and Policy (J-5) Directorate of the Joint Staff. The authors thank D. Christian Addicott and Maj. Alyssa Drew, U.S. Army, for their advice. This paper does not necessarily reflect the views of the Department of Defense. The National Security Strategy of the United States of America, White House, Washington, D.C., Mar. 2006, p. 5. "Maintaining Israel's Qualitative Military Edge: Dilemmas for the Bush Administration," Jerusalem Issue Brief, Jerusalem Center for Public Affairs, Dec. 16, 2001. Romesh Ratnesar, "May 14, 1948," Time Magazine, Mar. 31, 2003; "Letter from Eliahu Epstein to President Truman, May 14, 1948, Telegram regarding President Truman's announcement that the U.S. had officially recognized Palestine's new provisional government," Harry S Truman Library and Museum collection, accessed Aug. 23, 2007. Yuval Steinitz, "The Growing Threat to Israel's Qualitative Military Edge," Jerusalem Issue Brief, Jerusalem Center for Public Affairs, Dec. 11, 2003. "Israel: The Yom Kippur War," Brittanica Online, accessed Sept. 18, 2007. The New York Times, Aug. 17, 2007. Colin L. Powell, remarks at the American Israel Public Affairs Committee, Washington, D.C., Mar. 19, 2001. "Maintaining Israel's Qualitative Military Edge." See, for example, LTC Stephen H. Gotowicki, "Considering a U.S. Military Force on the Golan: Confronting Hyperbole, Paranoia, Hysteria, and Agendas," Foreign Military Studies Office, U.S. Army, May 8, 1996. "The Qualitative Edge," JINSA Online, Apr. 1, 1994; Louis Rene Beres, "Israel's Uncertain Strategic Future," Parameters, Spring 2007, pp. 37-54. Shai Feldman and Abdullah Toukan, Bridging the Gap: A Future Security Architecture for the Middle East (New York: Carnegie Commission on Preventing Deadly Conflict Series, Carnegie Corporation, 1997), chap. 3, p. 48. "AMRAAM Said NOT to Impact on Israel's Qualitative Military Edge," JINSA Online, May 1, 1995. The New York Times, Sept. 27, 1992. "Israel: Nuclear Weapons," Federation of American Scientists, accessed Aug. 21, 2007; BBC News, Aug. 23, 2000. "Israel's Qualitative Military Edge," Israeli delegation presentation to the U.S. Defense Policy Advisory Group (DPAG), Washington, D.C., Apr. 4, 2006. Fort Worth Star-Telegram, Aug. 25, 1998. Warren Christopher, "Maintaining the Momentum for Peace in the Middle East," speech at Georgetown University, Washington, D.C., Oct 24, 1994; Barry Rubin "The United States and the Middle East, 1994," in Ami Ayalon and Bruce Maddy-Weitzman, eds., Middle East Contemporary Survey, 1994, vol. 18 (New York: Westview Press, 1996), accessed Oct. 19, 2007. "Congressional Budget Justification for Foreign Operations, Fiscal Year 2007," U.S. Department of State, Washington, D.C., Feb. 13, 2006, p. 462. "Recognizing Iran as a Strategic Threat: An Intelligence Challenge for the United States," U.S. House Permanent Select Committee on Intelligence, Subcommittee on Intelligence Policy, Washington, D.C., Aug. 23, 2006. "Country Reports on Terrorism, 2004," U.S. Department of State, Office of the Coordinator for Counterterrorism, Apr. 2005, p. 88. "Recognizing Iran as a Strategic Threat," Aug. 23, 2006. U.N. Security Council resolutions 1696, 1737, and 1747. "Coping with Iran: Confrontation, Containment or Engagement?," summary, RAND Public Policy Forum Conference, Washington, D.C., Mar. 21, 2007. Condoleezza Rice, secretary of state, "The New Way Forward in Iraq," testimony before the Senate Foreign Relations Committee, Washington, D.C., Jan. 11, 2007. The Boston Globe, Mar. 21, 2007; Condoleezza Rice, interview with Reuters, Dec. 16, 2006; Jim Saxton (Rep.-N.J.), "Reshaping Our Iran Policy," The National Interest, Jan. 3, 2007. Dalia Dassa Kaye, "A Strategy for Iran," United Press International, Feb. 10, 2006. Gotowicki, "U.S. Military Force on the Golan," p. 9. Defense News (Springfield, Va.), Mar. 12, 2007. Defense News, Mar. 12, 2007. Defense Industry Daily (Thetford Ctr., Vt.), Dec. 11, 2006. Related Topics: Arab-Israel conflict & diplomacy, Israel & Zionism, Strategic alliances, US policy | Winter 2008 MEQ receive the latest by email: subscribe to the free mef mailing list This text may be reposted or forwarded so long as it is presented as an integral whole with complete and accurate information provided about its author, date, place of publication, and original URL.